To appreciate Ken's in Hilo, you have to love a good diner. If diner fare is not your style, you probably won't be impressed by Ken's offerings, but if you love a great diner atmosphere where you can get good food on the cheap 24/7, then Ken's House of Pancakes is the place to go. Ken's bills itself as the place for "ono grinds… anytime" (in Hawaii, grinds are food and ono means delicious). For more than 40 years, Ken's has been serving up pancakes, omelets, burgers and more and is consistently voted the best breakfast spot and best diner on the island by locals. 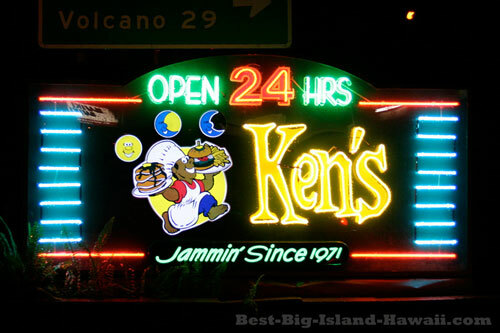 Ken's House of Pancakes sits at the corner of Highways 19 and 11 between downtown Hilo and the airport. It's almost always busy and the crowd is a mix of locals there for the thousandth time and visitors who want to see what all the fuss is about. Service can be hit and miss (it wouldn't be a diner otherwise, right?) but it's friendly and the food is tasty. It's a great place to try a local dish like a Loco Moco (white rice topped with a choice of meat, gravy and fried eggs), kalua pig (traditional pit oven roasted pork), or noodle bowls. Of course, dozens of other diner staples from waffles to steak and eggs. The portions at Ken's generally big and a good value. If that's not enough, you can pick out a "sumo sized" meal. And what kind of a diner would Ken's be if they didn't have a huge selection of pies and desserts. They've also got island style sundaes with macadamia nuts and coconut, guava or lilikoi (passionfruit) toppings. Check out the Ken's House of Pancakes website for hours, location, nightly specials and more.